The head of the International Atomic Energy Agency said that Iran has failed to provide the information or access needed to allay the agency’s concerns about the weapons potential of the country’s nuclear program. With the deadline nearing for international talks on constraining Iran’s nuclear program, Yukiya Amano, director general of the IAEA, said in an interview that Iran has replied to just one of a dozen queries about “possible military dimensions” of past nuclear activities. Amano said that Iran has provided only “very limited” information about two other issues, while the rest have not been addressed at all. “Recently, the progress is very limited,” he said. The IAEA is the United Nations’ nuclear watchdog, and its inspections are considered a key safeguard against countries using civilian nuclear energy technology to produce weapons. Failure by Iran to comply with IAEA demands would undermine the country’s efforts to win the lifting of U.N. sanctions. Amano said that the six global powers negotiating with Iran should insist that the country implement the additional protocol that would allow IAEA inspectors to go anywhere at any time to examine sites suspected of harboring secret nuclear weapons development. He said that he spoke to Iranian Foreign Minister Mohammad Javad Zarif on Feb. 7 in Munich but noted that Iran has not yet provided the information the agency needs. Amano met early Tuesday with U.S. Secretary of State John F. Kerry. He was scheduled to meet later with President Obama’s national security adviser, Susan E. Rice. That additional protocol, Amano said, will be “very much needed. It will give us more powerful tools to look at activities not declared to us.” He said that in the past the agency has had two to four inspectors in Iran, but that recently there have been as many as 10. Iran signed the protocol in December 2003 and initially implemented it, Amano said, but the country ended its compliance in 2006. Amano said that near the top of his list of unanswered questions about possible military dimensions of Iranian nuclear activities was the Parchin military complex. 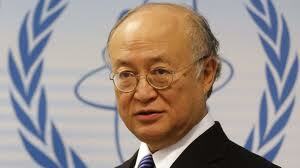 He said that the IAEA has information that Iran conducted experiments in a high-explosive chamber there. “We would like to have access, and we would like to clarify,” Amano said. He said Iran had twice given IAEA inspectors access to the base, but he added that Parchin “is a huge area with many buildings.” Now, he said, the IAEA thinks it has identified “the right place to visit,” but its access has been blocked. After the agency requested admittance to that area in late 2011, it observed by satellite extensive landscaping, demolition and new construction there. Amano said that the IAEA’s failure to detect Iraq’s nuclear weapons program in the 1980s had forced the agency to demand unfettered access to countries suspected of building weapons in secret. In openly declared sites, he said, the agency places cameras and seals in strategic places so that it can “detect abnormalities in a timely manner,” ranging from a day to a week. Surely we’ll hear from the Tehran fans telling us that the IAEA is part of a terrible Zionist plot against the loveable peaceful moderate ayatollahs? Curiously, whenever Iran(or similar dogsxit) is mentioned, the fruit-flies hover around in such a cloud!